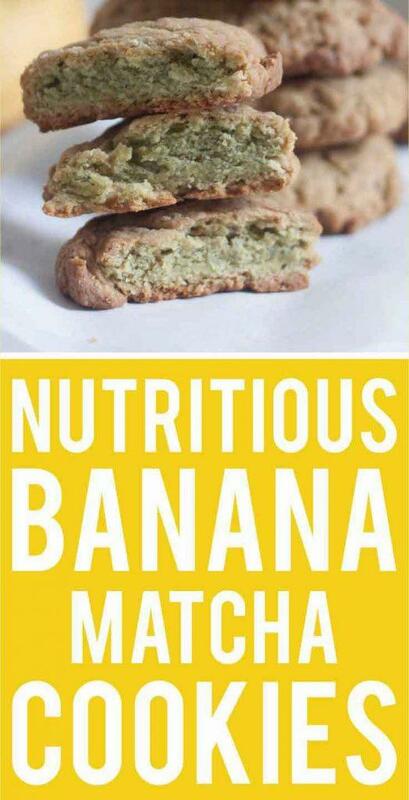 Healthy Cookies Made with Banana and Matcha. Super Nutritious! Using Matcha powder in baking recipes is a fantastic way of incorporating plenty of nutrients into everyday meals. 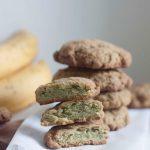 These delicious Matcha cookies make the perfect afternoon snack or lunchbox treat and contain plenty of vitamins, minerals, and antioxidants. They’re a fun to get your kids eating healthy and something the whole family can enjoy. Matcha powder is made from the highest quality green tea and has many powerful health benefits. It contains polyphenols, which have an antimicrobial effect and can help your body fight off infections, as well as chlorophyll, which promotes a healthy digestive system. Matcha powder also contains more antioxidants than broccoli and spinach and is high in amino acids which can help you concentrate and improve your memory capacity. It’s always best to use pure Matcha powder which has a slightly sweet flavor and deep aroma. Find our favorite matcha powder here. Spelt flour is growing in popularity as a substitute for wheat flour, as it has a similar nutritional profile and an appealing nutty flavor which is comparable to whole wheat flour. Although it does contain gluten, it is easier to digest than the gluten present in wheat and has fewer calories. It also has a higher protein content and is rich in minerals and B Vitamins. You can use coconut instead of butter or vegetable in many baking recipes. It’s high in medium-chain fatty acids which are easily processed by your body to create a good source of energy, as well lauric acid, which has natural antibacterial and antifungal properties. Banana gives these cookies a lovely flavor and is a good source of fiber, potassium, Vitamin B6, Vitamin C, antioxidants, and phytonutrients. Bananas also have a low GI, which means they don’t raise blood sugar levels as much as other high-carb fruits. Coconut sugar is a natural alternative to regular sugar and contains nutrients and minerals such as iron, zinc, calcium, potassium, short-chain fatty acids and polyphenols. It’s made from the sap of coconut palms which is placed under heat until its water content evaporates. It has a lower GI index than regular sugar but is still high in calories and fructose, so should be used sparingly. Love this recipe? Check out our other sweets and treats. These delicious Matcha cookies make the perfect afternoon snack or lunchbox treat and contain plenty of vitamins, minerals, and antioxidants. They’re a fun to get your kids eating healthy and something the whole family can enjoy. Preheat the oven to 355 F or 180ºC, and line a baking sheet with parchment paper. In a large bowl, combine the spelt flour, Matcha powder, coconut sugar, baking powder and salt. In a smaller bowl, mash the banana with a fork, and then add it to the dry ingredients. Pour in the coconut oil, and mix until the dough starts to come together. It should feel springy and easy to manage, you might need to add a touch more flour if the dough is too sticky. Divide it into 10 pieces, and then roll into small balls. Place them on the baking sheet allowing some space for the cookies to expand, and then press down with the back of a fork. If you prefer a more uniform finish, roll out the dough and then use a cookie cutter instead. Bake them in the oven for 10 to 15 minutes, and then place on a rack to cool. If you want to store them for later, just keep them in an airtight container. Next articleEasy Lunches for Your Toddler. You’ll Never Run Out of Lunch Ideas Again!